1. 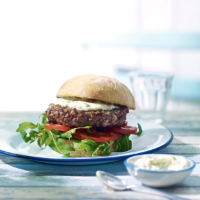 Mix the shallot and Gorgonzola into the beef and shape into 4 even-sized burgers. Cook under a medium grill for 7–8 minutes on each side until cooked through with no pink meat and nicely browned on the outside. 2. Meanwhile, pick the basil leaves from the stalks and finely chop. the rocket and tomato on the bases and top with the burgers. Spoon over the basil dressing, top with the bun and serve. hour to make sure they hold their shape while turning.